After four days of hiking Upper Muley Twist Canyon and Lower Muley Twist Canyon, Joan and I decided to play tourist for the day. With rain imminent and my windshield wipers giving me warning signs of failure, after my colorful geology adventure in Dixie National Forest, I prioritized the repair and returned to St George. Well long story short, they didn’t have the part and couldn’t get it for several more days. Watching the storm at Gunlock State Park improved my mood. So once again I gambled and continued on my way. I drove to Cedar City. Thankfully only a little rain and wipers behaved. I hung out in town for a few hours working on blog posts and photos. Soon enough snow started piling up. When the storm took a breather, I decided I best make a run for it. I didn’t really have a plan but landed at Parowan Gap. Despite the cold temps, it had stopped snowing so I decided to explore. The rocks are so uninspiring . . . until you look closer. Ah, is the storm over? It might have been a little chilly during the night. I’m always thankful for a warm sleeping pad and bag. I was also thankful for my JetBoil which gives me a hot cup of coffee and cereal, as well as provides me with a hand warmer. If it wasn’t so cold, maybe I would have explored this exhibit a bit. Check out the community of Parowan for eats, treats, etc. I tend to avoid state parks, but after seeing so many WOW photos and being an opportunist, it was impossible to say no. I’d spent the previous few days at Mojave National Preserve and then traveled along Lake Mead where I was lucky to catch this fantastic sunrise from my dispersed campsite. I even found some roadside flowers. This roadside hot spring surprised me. Will I get $10 worth of enjoyment? First stop was an aerobic one where I’d get to seem some rock art. The reward for the climb. My first hike was the 1.25 mile loop around White Domes. I’ll let the photos speak for themselves. YES I was WOW’D! It seems everyone knows about THE wave in the Vermilion Cliffs of Arizona. Access to THE wave requires patience, planning and persistence, all things I avoid. I knew the lighting wasn’t ideal, but I decided to check out this 1.5-2 mile round-trip hike. I was underimpressed with this 1-mile round trip hike. I didn’t take any photos until the end where you are supposed to get a panoramic view of multi-colored sandstone. No WOW view nor multiple colors in my opinion, so the best I could do was capture an arch like shot. All that was lacking on the Rainbow Vista Trail was more than made up for on the 1 mile round-trip hike on Mouse’s Tank Trail. When you look around you see lots of varnished walls, but look closer and you’ll be rewarded for your efforts. Age and vandalism is causing significant loss. Some art is harder to find than others. You could easily spend days and weeks scouring these canyons. This particular hike is a treasure trove. I took tons of photos as I climbed into nooks and crannies. At the end of the canyon is Mouse’s Tank, a pot hole of water, extremely difficult to access. Maybe the name is because only a mouse can access it? But alas according to the handout, it was named for an outlaw who used the area as a hideout in the 1890’s. This triplex is a good example of tiny house living. Cozy with views, fireplace included. I climbed up on some rocks near the east entrance for a sunset view. It was one of those nights though when not much happened. 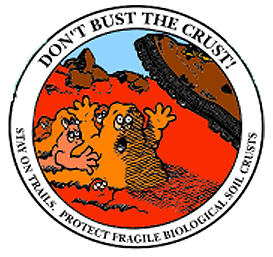 Be aware and knowledgeable of biological soil. Of course there are plenty of choices for good eats like this from Big Bear Diner.